The house origins date back to mid-c. XV. For more than three centuries the family worked the quarries at the nearby hill where, from the same time, stands the church and the Franciscan convent of Saint Sebastian. The stone that so many generations worked served to build and expand so many farms in La Bisbal and the surrounding villages and the successive reforms of the Convent. Result of this activity arises the original name of the estate, Mas Paretes (Stones), today known as Mas Petit. Since the beginning of the XIX C. the people of the house worked more and more on the cultivation of the surrounding fields, as other materials began to be used for construction. Farming continued until late 1990’s, although the house was vacated from 1965 to 2000. That year began the house reconstruction to become a rural accommodation, respecting all of the spaces and the character of old neighborhood that characterises Mas Petit. The works lasted for two years, until the spring of 2002, when we inaugurated Mas Petit. Since then, a lot guests have enjoyed many great moments, some have returned again and again and we are very proud to share a small part of Baix Emporda’s history with you. Mas Petit is in the municipality of La Bisbal d’Empordà, at the Empordà plain, touching Gavarres range and watered by Daró river. 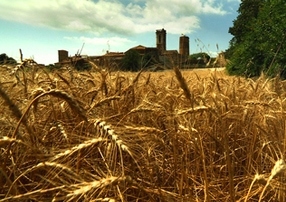 This privileged location allows you to enjoy Baix Empordà and Costa Brava with very short journeys. The town has a recognized cultural offer, it’s traditional ceramic design and production, it’s heritage, fairs, very reputated antiques shops and the oldest existing street market in Catalunya, granted by King Jaume II (1267 – 1327) back in 1322. The charm of the setting is incomparable, with the medieval villages of Pals, Peratallada, Monells, Cruïlles, Sant Sadurní de l’Heura, Palau-Sator, Ullastret, Madremanya, Vulpellac or Canapost are a must visit. You will enjoy lots of nice restaurants spread all over the territory. 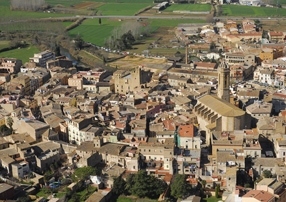 The “Empordanet” is the flat area of the Baix Emporda, the inland part of Costa Brava. Unlike the coast, what you find the most is the quietness, the calm of traditional agriculture. Some coastal towns are not equally precious, characterized by stone structures, such as poles, which is worth a visit virtually obligatory. Begur top of a hill above the sea in a castle which is easily accessible on foot and beautiful beaches at their feet (Aiguablava, Sa Tuna, Sa Riera). Peratallada with lovely places to walk and eat. Sant Feliu de Boada, small and cozy rupees with its famous cake, Monells, with its magnificent arcaded square and Púbol where the Gala Dalí Castle House Museum, gift of genius and his muse, Gala, the 1969 and last workshop of the painter from 1982 to 1984. Because the distances are short, it is best to establish a unique place to sleep and travel by car from one place to another, while enjoying the unspoilt Empordanet. 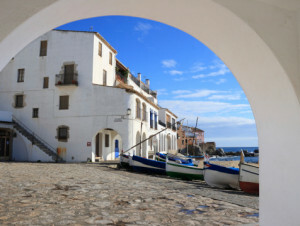 Costa Brava is Girona’s coast. It begins in Blanes in the south and ends at the French border to the north, more than 200 km of coast. Includes three coastal counties: La Selva, Baix Empordà and Alt Empordà. Thanks to its geomorphology, many of the original landscape areas remain few contaminated by urbanization. Amazing the variety of its beaches. From huge sandbanks several kilometers long (Pals, L’Estartit, Sant Pere Pescador, Roses) to a multitude of hidden and inaccessible coves (cala Estreta, Roca Bona, cap de Planas, el Crit, cala Pedrosa, Aigua Xelida, Illa Roja), surrounded by clifts and pines in touch with the sea. A delicately harmonious combination, the pines’ intense green, the roundness of the rocks, the sweetness of golden sand and deep blue glow of the sea. This is Costa Brava.